2014 will go down as a great one for Ballintubber but sadly their year ended in disappointment this afternoon at MacHale Park. Appearing in their first ever Connacht senior club final, the Mayo champions were comprehensively outplayed by Galway champions Corofin, losing on a scoreline of 2-13 to 1-7. A nine-point losing margin tells its own story and, by the sounds of it, it was a contest that the Tubbermen never really got to grips with at any stage. They trailed by 0-7 to 0-4 at the break but Corofin then added 2-3 to their tally without reply on the resumption and that, effectively, was that. Corofin eased their way to victory from there to clinch their sixth provincial title and their first since 2009. 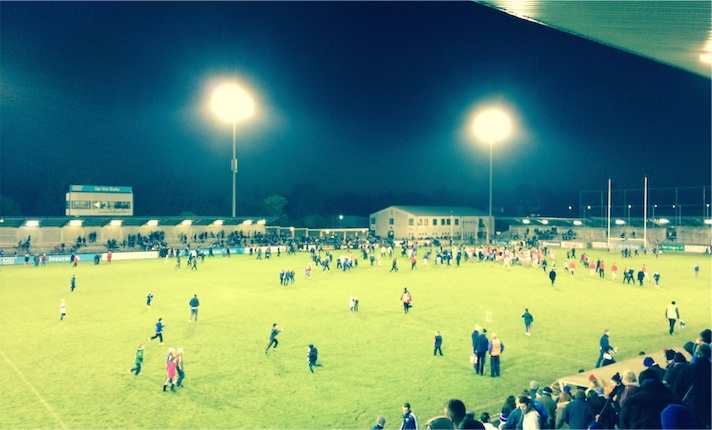 Match reports on today’s final are here – Mayo Advertiser, RTÉ, The Score. Once again, my focus this afternoon was on matters closer to home up here in the capital where at Parnell Park St Vincents’ run continued with victory over Garrycastle in the Leinster semi-final. The final scoreline of 3-9 to 1-10 in favour of the reigning Dublin, Leinster and All-Ireland champions would suggest that it was a reasonably straightforward victory for them over the Westmeath champions but this was far from the case. It was instead a match that Vinnies had to win twice. The Marino lads started the game like an express train and were completely on top for the first twenty minutes or so. Mossy Quinn smashed home a great goal a few minutes after the throw-in and while a number of chances for further goals were spurned Vinnies kept the scoreboard ticking over with some nicely taken points. Eventually they broke through for a second major, this one from Shane Carthy, and at that stage, with the gap at ten points, a real tanking for Garrycastle looked likely. However, with the evergreen Dessie Dolan (who ended the day with 1-5 to his credit) pulling the strings for them, the Westmeath lads dragged themselves back into the contest and four points on the spin cut the deficit to six points at the break. They kept it up after the restart too, with two further points before Dolan pounced to smash home a cracking goal which cut Vincents’ lead to just a single point. Five minutes later, a Michael Monaghan point levelled the contest. Vinnies were fairly shellshocked at that stage but it was then that their greater experience really stood to them. Forced to dig deep in a contest that should in honesty have been over at half-time, they found the extra bit of momentum they needed and points from Mossy Quinn (a free) and a super long range score from play by Ger Brennan gave them some vital breathing space. It was still nervy enough coming down the closing stretch as Garrycastle continued to pour forward but the champions never panicked and eventually they sealed the match with a penalty goal from Mossy Quinn five minutes from time. This came from a move that saw Ruairi Trainor wrestled to the ground by the Garrycastle ‘keeper after he’d rounded him inside the small square and was about to pull the trigger. Vinnies then completed the win with a flowing end-to-end move in injury time, which ended in Mossy Quinn popping over the evening’s final score. The Marino men will now defend their provincial title in three weeks time, when they face Offaly champions Rhode in the Leinster decider. The winner from that one will then face today’s newly-crowned Connacht champions in the All-Ireland semi-final next February. On today’s evidence, Corofin look set to provide a serious test for whoever advances to meet them at the business end of the club championship early in the New Year. I was in Castlebar today and can honestly say I’ve never seen a better display of foot passing in my life. As much credit as Rochford and the current selectors deserve, the coaching systems that they have put in place to produce skills like that deserve equal billing. They will take some stopping. Agreed Liam, Corofin were phenomenal today and they put on a stunning display of football that was at times sublime to watch. They’re a seriously skilful outfit and will be very hard beaten this year if they put on another performance of that calibre. Commiserations to Ballintubber who today unfortunately didn’t much resemble the classy, determined team we saw two weeks ago – they looked sluggish, shellshocked and unsure of themselves, and they couldn’t catch a break anywhere on the field. I’ve no doubt though that while a defeat like this will sting for a while, it will stand to them in the long run and they’ll come back a hardier outfit next year. Being in a slightly pedantic mood this morning, I would like to point out that the newly crowned champions have to play Tir Chonaill Gaels before meeting the Leinster champions. Pedantic is good, Berry – thanks for pointing that out. Corofins second goal, 10 minutes into a second half that had already seen them score 1-2 without reply or without a wide!, was as good as anything I have seen. Farraghers driven pass out to Sice must have travelled 30 or 40 yards and yet never rose above 15 foot from the pitch. It was a thing of beauty as Sice, who was fairly clipping up the wing, never had to break stride as the ball sailed over his left shoulder and into his paws. The speed with which he then headed direct for goal was blistering and saw him pulling away from the Tubber defence. An unselfish firm hand pass inside finished the move to the back of the net. Corofin got the start in the second half that Ballintubber badly needed. The performance of the 2 Corofin corner forwards in the first half was outstanding. Between them, Martin Farragher and Ian Burke either scored or assisted in 6 of their first half total of 7 points. It brought back terrible flashbacks of the demolision job the 2 Roscommon corner forwards did on us in the U21 championship, also at MacHale Park. We could not handle them that evening and Ballintubber could not handle these two yesterday either. Cathal Hallinan, who had no.3 on his back but was operating at no.6 to try and lessen the early influence of Lundy, had to switch to right corner back after 12 minutes to try and negate the damage that Farragher was inflicting. It half worked but then Corofin just exploited the space in the central areas that Hallinan vacted, and Delaney and Michael Farragher continued the damage. Was at the match yesterday as well. I know Corofin were very good and play a lovely style of football – fast with very accurate kick-passing, but Ballintubber were so poor. I’ve watched all their knock-out games this year, and that is by far their worst performance. Gibbons at mid-field was no where near county standard. Dillon and Diarmuid O’Connor were very good, however. Ballintubber looked afraid to take the game to Corofin, fearful of their reputation or something, and after they had 3-4 wides early on you could see them lose confidence and Corofin looked like they realised these lads aren’t up to much. Such a pity, as I’d liked to have seen them win Connacht and challenge for an AI next year. For me, the outstanding thing to take from the game was the tactical difference between the two sides and the influence this difference had on the outcome of the match. The clash of tactics was obvious and emphasized yet again that the game is called “football” for a reason and that an accurate direct foot passing style of play, executed well, is very very difficult to counter. The ball will always travel faster than the man, or woman, and you expend no energy in kicking a ball 30 yards when compared with the effort and energy required to make an overlapping 30 yard handpassing run. Yesterdays game, in my opinion, was a re-run of this years Kerry v Cork Munster championship match. Kerry kick-passed Cork to death that day and Cork tried to respond by running and hand passing themselves into crowded areas before eventually either losing possession or taking shots from poor areas, oftentimes off balance resulting in more wides than scores. Corofin, right from the off, were using fast accurate direct foot passes over 20 to 35 yards and these passes were in front of their forwards. Their forwards, Farragher and Burke in particular, knew exactly what type of ball they were going to be supplied and made their runs early which meant they were out in front of the Ballintubber backs. The Corofin man in possession always had a supporting player running off him and so always had two options, either give the pass to the runner or use him as a decoy, take your man on and go for a score. It took them 9 minutes to register their first score but 12 minutes later they had chalked up their fifth. Their midfield was dominating possession by breaking ball to their half forwards and their use of the ball was exceptional. An accurate kicking game will always keep your opponent pinned back in their own half because the defence will be wary to press high up the field, either on the counter attack or to challenge, for fear of leaving too much space behind them that will be exploited by a kick pass in behind. Also, quick accurate foot passes give the forwards what they need to be effective. Space. This tactic, whilst attractive from a attacking “skill-set” point of view, is also highly effective defensively because you are not committing your wing backs to carrying the ball forward on overlapping runs by way of creating attacks via overloading your oppponents defense. It means your backs can concentrate on their first priority, defending. In contrast, Ballintubber using the short hand passing running game were working very very hard and burning alot of energy in just clearing their defensive areas. A short hand passing game increases your possession of the ball, but it also means you are having to execute alot of passes to cover the ground, and as such, the movement of the ball through the field is slow. The build up play was too slow and too laboured. Therefore, when the ball did get up to the Ballintubber full forward line they had little or no space in which to create scoring chances because the six Corofin backs, plus two midfielders, had time to get back into position and close off space in front of their goal. Ballintubber were forced wide and were hassled into taking shots from poor positions. This saw them register 3 wides before they got on the scoreboard to begin with. No one can doubt the quality of the Ballintubber forwards from an individual point of view, but the style of play and tactics employed by their team, allied to the defensive set-up of Corofin meant that they were always struggling to create quality scoring opportunities. Because Myles Kelly and Ruaidhri O’Connor could not break free from their positions on attacking runs, it meant that Alan Dillion and Diarmuid O’Connor dropped deeper and deeper in search of the ball. When they got on the ball they ended up passing laterally as there was no one making runs in the half forward line that they had just vacated and indeed at times there was only two Ballintubber players inside the Corofin 45. This is what happens when the wing backs that are normally contributing to your attacks, cannot because they are pinned inside their own 45 and too busy defending. It was a failing of Mayo in the last two years in that we relied on Keegan, Vaughan or Boyle too heavily to help create overlapping runs and carry the ball forward into our half forward line. When we eventually came up against an attack that had to be marked tightly, our attack and our much maligned half forward line suffered accordingly. Something similar happened Ballintubber yesterday and the feeling may persist that, while they came up against an outstanding team in Corofin, they did not do themselves justice in their own performance and much of that was down to pure tactics on the day. Apologies, “was a re-run of this years Kerry v Cork Munster championship” Last years I meant. Great analysis Pebblesmeller. The supporting player tactic was a constant and one that worked really well for them throughout when they did run at the Ballintubber defence, in contrast to the sluggish movement of the ball in the other direction. Their kick passing was really something else to watch and as you say, that second goal was sublime. That win will seriously boost Galway football too – Corofin themselves yesterday would have been a match for a Mayo senior team, if you ask me. Overall it was just a day when very few of the Ballintubber lads reached the potential we know they can. Jason Gibbons took a knock to the head just before half time which can’t have helped, but up til then, the clean fielding that had been a feature of his game up til yesterday wasn’t in evidence – not helped by conditions I’m sure. Not to single him out – it was a below par performance across the board and undoubtedly a frustrating day for the Ballintubber forward line who we saw going deeper and deeper to try and win ball as the game progressed. That’s just the way it goes sometimes – today will be a tough day for them, but I sincerely hope it will galvanise the resolve for next year. I also felt that more could have been done from the sideline at an earlier point – the switches and substitutions came too late to have any impact on the game. Pebble smeller. That’s a fair comment, well said. Tomas o se said the same thing somewhere this year, the Kerry lads do a lot of kick pass practice. For what it’s worth, I think cillian o Connor is a very good kick passer. Remember the kick pass to Keegan for the punched goal earlier this year? Inch perfect. Or the high dropping ball, controlled under his boot and flicked to Andy Moran to kick over? That’s real skill, not many would even think of it, let alone try it. Hard luck to Ballintubber. The performance wasn’t there on the day. Corofin were very very good and their method of play was just sublime. Ballintubber will have learned a lot about themselves and the level required to compete at the very top. They have had a great year and will be a force again in 2015. Disappointing end to the year for Tubber. It’s been a long season for the likes of COC and Alan Dillon so a break from training might do them the world of good over the winter. Cillian O Connor will be playing with UUJ in McKenna cup January and sigerson cup in February he certainly needs the months rest now. That tough going for coc. Hopefully he will be captain next year.did anyone read morts book is it any good. The lads don’t have much of a break really do they? Some of them will be back playing again in 5/6 weeks! Yeah its crazy really, when you think about it, the short break that the players get now. I heard the Australian coach say that even though the Australian players are professional, they get to have more time off during the season. While here in Ireland the GAA season, pretty much lasts for the whole year. On the evidence of yesterdays performance alone, Stephen Rochford’s stock is most certainly rising…. With the greatest of respect Wj, I really respect and enjoy your blog but Ballintubber getting two paragraphs to a Dublin club getting 7? Point taken, David, but the simple explanation is that it was the match I was at and so it’s natural that I’d have more to say about it. Also, I’ve never hidden my club allegiance here and I’m not going to start now. Even though I hadn’t that much to say about the match in MacHale Park, others provided plenty of excellent detail on it in the comments so I think that overall it got a fair bit of coverage. This isn’t the Western, though, and makes no claims to be! It’s been a while my friend, may I ask what you base your pessimistic outlook for 2015 on Bridge? Would it be the wishful thinking of an individual from a neighbouring county who have as much chance of All Ireland glory as the Dalai Lama? I too am puzzled Corrick-not a ball even inflated yet for 2015…. Pessimistic about 2015??? I have come across quite a few who expressed the same opinion without any convincing explanation for their views. Maybe it’s in our nature to be pessimistic about these matters. Personally, I am looking forward to 2015. We mightn’t win it but by god these lads will again give us something to shout about unless I am badly mistaken. Sometimes I think we will probably win an all Ireland when we least expect it. And you never know what might happen in 2015. That’s what makes it all so interesting and fascinating. I hate this time of year and I can’t wait for January and the FBD and the whole circus to start up again. I know that it was disappointing the way Ballintubber’s year ended, it just was not there day against Corofin but it now means that Noel and Pat will have a clean slate to choose from on the 4th of Jan. Seen as we have no club players involved in the All-Ireland series it now means that any players the lads feel deserve a chance should now be available. Last year none of the Castlebar or Kiltaine lads were available, early in the year for trial games etc., as they were involved in club action. It now means that players from these two clubs and Ballintubber as well will now be free to be given a chance with Mayo. So as they say every cloud has a silver lining. Best of luck to the two lads in picking the right combinations! Fingers crossed that there is one major season left in the current lads along with a few new additions, the future should still be bright for us. Surely to God, next year the lads will have full belief that they are good enough, after what they went through this year. Your right and can’t wait for next year and hope corofin beat Vincent’s I know that won’t go down to well. plenty of debate so i add my twopence. mayo had an all star midfielder in 2013 who was deployed at centre foward in 2014, a mistake in my opinion.david moran had a tour de force in limerick and needed to be marked by our very best midfielder. i would like to see the two o sheas in midfield next year, dillon at 11 , vaughan at 3, o connor at 14.cunniffe at 6. There’s no reason to be pessimistic about mayo in 2015. They’ll be very close again and with a bit more tactical awareness they’ll be a match for anyone. The best thing they can do is get rest and study those games against Kerry, plenty to learn from those 2 games. Any word yet on who the. 20 new lads training for the fbd and league are? Pessimisim?? look at the stats from the Kerry replay. We had as many successful foot passes as Kerry, scored more from play but, as corick bridge correctly identified, we were beaten comprehensively in the middle third where we lost 60% of our OWN kick outs! That gave the Kerry midfield, and half forwards, the ball in our half of the field and is was easy to supply accurate ball into our full back line from there. There is very little wrong with our current set-up and we will be there or thereabouts again. I do expect a stronger challenge from Roscommon and Galway this year but if we can work on a more expansive attack, i.e. moving the ball quickly into space for our forwards as opposed to running it from our half back line, we will fine. 2015 has not even started and already the terms optimism and pessimism are being bandied about . Whatever happened to opinions just being just opinions and sometimes different? Personally and I hope that I am wrong, I feel that teams get their time and then tend to wane. During that period some teams close the deal some do not. Mayo 96 to 99 is an example. The Meath team of that era won two AIs and then faded like the Mayo team of that era. This Mayo team has been there or there or abouts for past three to four years. I think it is highly like that they may be on the wane next year and their is nothing unusual about that. That is my opionion – negative or positive, optimistic or pessimistic?? It is just my opinion. Ballintubber just didn’t get going and were flat on the day. 4 wides in the first 15 minutes from scorable areas was a killer especially when Tubber seemed to be getting the better of the early exchanges. Tubber were chasing the game from early on then and needed an early goal like they got against knockmore, Castlebar & Bridget’s. It never came and Tubber just struggled. Overall Corofin were just too strong on the day and deserved their win. I was very impressed with them and Stephen Rochford has brought them on leaps & bounds from last year. Corofin better team, played some great stuff. Cillian double, sometimes treble, marked in first ten to fifteen minutes leading to tubber half backs and midfielders dwelling on the ball too long and allowing Corofin to funnel back further blocking up space. Then Cillian and Dillon had to come further and further back to find a means of having some influence on the game. Accurate kick passing to an electric set of forwards meant Btubber were on the back foot from start to finish. Good mangement by Rochford, a very well drilled, talented outfit, will take some stopping. It looked to me that Ballintubber tried to isolate Cillian up front by bringing their corner forwards outfield but the Corofin corner backs did not follow them. Ballintubber did not adapt by using their free corner forwards and apart from Alan Dillon the Ballintubber were very reluctant to go for their own scores.Shooting a few early wides seemed to further discourage them. Diarmuid O’Connor did a lot of good work but his failure to score puts a question mark over his potential contribution to Mayo next summer. Apart from that Corofin’s accurate kick passing and quick delivery of the ball proved too much for Ballintubber whose defenders rarely got to the ball first. Corofin’s spread of scorers was in sharp contrast to Ballintubber’s forwards. Ballintubber’s midfield was a major disappointment, Jason Gibbons in particular. He was so far from the player we saw during Mayo’s league campaign it was unbelievable. Perhaps the injury he suffered last summer was still hampering him. Finally the only bright spot on the day was that Stephen Rochford seems to be a mighty prospect as a coach. Hopefully Mayo Co board will ensure that he is using his talents for Mayo’s benefit before to long. Nov is a depressing month. But Jan is just around the corner. Looking forward to some league action already. I am a big supporter of Pat and Noel and I wish them well. Many of out better players have a lot of mileage on the clock. I am looking forward to some new tallent emerge in the Pat and Noel era. I hope you’re right PJ, but I suppose (for me anyway) the fact that we’re entering into a new era of management makes it all that bit more twitchy for all of us. I hope Pat and Noel get off to the best start and have the best middle and continue with the best possible ending next year…but I have my reservations about them. True, they won the U-21 AI in 2006, but that’s coming on 9 years next May. As I said, I don’t know what to expect, other than the fact that Galway will probably be better again than the summer gone by and an ever improving Ros with their tails up in the Connacht final (if they get there and we get there). I hope our fellas are on their toes all the time and don’t ‘stand still’, as in thinking that we’ve beaten these guys handily in the recent past we’ll beat them again. I also think the league will be tricky enough as we always usually have a bad game in MacHale Park too each spring. Don’t eat me for it…just my opinion! AndyD I’m scratching my head at a couple of your comments there. You question Jason Gibbons and suggest that his summer injury may have hampered him. If that’s the case, I can’t figure out how he managed to produce such an excellent club campaign up til that point. In particular, he was superb against St. Brigid’s, so unless this injury has mysteriously resurfaced then I fail to see how that can be the case. You also single out Diarmuid O’Connor and suggest that his failure to score “raises question marks” about his contribution to Mayo next summer. There are so many things wrong with that statement that I don’t know where to start. Diarmuid has been one of Ballintubber’s shining lights throughout this campaign, and indeed was one of their better performers on Sunday when so many went missing. For a lad that’s not yet 20 (AFAIK) he has demonstrated a maturity and cleverness to his game that indicates we will see great things from him for club and for county. Two players scored for Ballintubber on Sunday, and only one of them from the full-forward line. So on a day when the entire team underperformed, I wouldn’t be raising any more questions about Diarmuid than I would about anyone else. Well said Ann Marie. I had difficulty with AndyD comment too and you have just said it how it is. Diarmaid is 19 FFS. Similar to so many club teams, Ballintubber had too many pasengers many of whom were slow and cumbersome and lacking the kind of pace neccessary at this level – Castlebar were equally exposed last year albeit at a later stage. 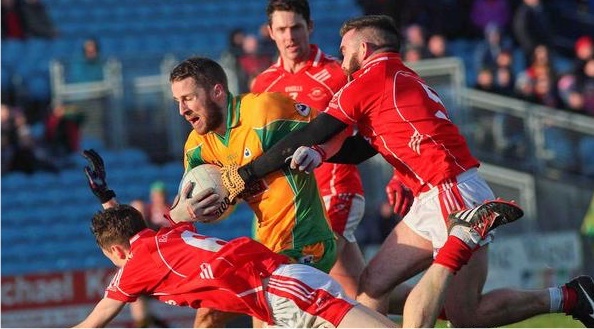 In gaelic football even one such player not getting to the ball first has a knock-on affect on their colleagues, causing indecision and handing overlaps to the opposition. Amazing how coaches are so slow to rectify such glaring deficiences. Players without real pace or without compensating attributes will always be found out..
Mayo Exile,Ballintubber are not Manchester Utd.They cannot buy lads that have pace etc.They juggled the deck that they had,or as a famous Tourmakeady man once said,they”danced with the girls that were in the hall”.Now unless they get a bigger hall I cannot see what else they could have done.They were beaten well on Sunday and a lot of the lads didn’t perform.Add to that,an opposition that never put a foot wrong,and you have what transpired.To suggest that they had too many passengers,cumbersome and not up to the level is a little harsh.The team is basically young and will learn a great deal from last Sunday.After all,that same (more or less)Corofin team were beaten on their ‘home’ patch last year-I didn’t hear any claims that they weren’t up to the required level. Anyone able to shed any light on the CB fundraiser taking place in Chicago this week-end.You’d imagine it would have been promoted here before they went-After all we all know expats that would support it if they were told about it.Then again why am I not suprised. I know Anne Marie-quelle supriise! Mike Tyson was boxing world champion at 19, don’t let age hold you back. It doesn’t matter what age Diarmuid O’Connor is – and I know he was minor last year. My point was that as he could not score last Sunday despite the amount of ball he got – which was to his credit – I cannot see him making a major contribution to Mayo next year. What Mayo need above all in the forwards are players who can win ball AND SCORE. Too much of that work is left to too few. Nor can you deny that Jason Gibbons had a very poor game against a midfield who do not feature for Galway. Indeed I thought he was the poorer of the two Ballintubber midfielders. Hard to argue with the scoring stats. Here they are from last years championship discounting NY as those games are no more than a farce really I think. The formatting on the previous post is pretty bad but you can still make out who did what against whom.Overall it shows how valuable Cillian is to us with a contribution of 40% of total scores. Jason Doherty had a great season too coming at second place while the evergreens Moran and Dillon are still there scoring consistently in games. Biggest disappointment was Alan Freeman who scored a solitary point from a free in last years championship. Others of note of course are Keegan and Mcloughlin who regularly contribute. Some of the comments here are way over the top. Whilst Ballintubber were well bet this is just a moment in the ever changing standards of training. Corofin have temporarily gone ahead. Knowing people from Corofin apparently the level and standard of training undertaken in the last year (or two) has reached a new level. I am sure other managers and trainers have noted what is going on and knowledge and information is being amassed that will result in a restoration of the status quo in Galway and Mayo over the next few years. Wont they? Where Corofin do differ though is in the type of training and encouragement being given to their underage teams. I have witnessed at first hand the quality of training offered at the club. Real skills being taught, real physical fitness habits and thinking being ingrained in young minds. Most clubs have a problem with this. Corofin seem to have developed an ethos of ‘training the trainer’. They also seem to care more for their underage players. I have seen the way they speak to their players – real respect given and expected by the trainers. What we need to do is clone the likes of Frank and Dave Morris and install them in our own clubs! Patriot & Anne-Marie, Andy D’s comments are spot on, and very insightful too. His analysis of the game is excellent and sums it up perfectly. When I got back form the game, people were asking me who played well for Ballintubber and my first answer was Diarmuid O’Connor, and they thought “great, we (senior team) need a pacy half-forward like him to come through”. Problem is, like Andy D said, he hasn’t shown me, yet, that he can score consistently, whereas I know McLoughlin and Doherty can. He seems to have great potential. Massive stamina, deceptively quick, and like his older brother, very clever on the ball. He just needs to learn from the great Alan Dillon how to take points from play. Andy D also mentions Gibbons, and even though he had a great game against Brigids, it’s hard to emphasize how bad he was the last day. A couple of times this year, his partner Broderick has looked the inter-county player not Gibbons. Again, it’s early days, and he showed great form prior to injury last year, but I’d have Barry Moran and Tom Parsons well ahead of him at mid-field. A few Mayo senior players are out in Chicago this weekend I believe for that fundraiser, other than that I know nothing. Anyone else hear anything? Broderick etc were execellent and the last day they were well policed, From all the blogs its unfair to lay all the blame on D O’C and Gibbons. Ballintubber had a free man behind midfield and they did not use him for their kick outs, Every ball was sent to Gibbons and he was not let catch them as Corofin had 2 men going up with him, every ball he broke was picked up by Corofin In fairness to Gibbons he did well to come back and play as he did after injury he picked up. Some body said O’Connor should take a leaf out of Dillon,s book on how to score points. Is this person talking about Dillon now or when he was 19 years old. I still believe both Gibbons and C O’ Connor have a future with Mayo. Corofin are worthy champions they will find a different team in Vincents if they meet. My god there are some so called experts on here who most probably never kicked a ball in their lives. I have not posted very much here before but i think i wont be returning even for a look after reading the rubbish on here. Yes Ballintubber were beaten by a better team “on the Day”, but i know that the scoreline and the performanceis not a reflection on the Gap between Ballintubber and Corofin. Corofin had their homework done for this one and Ballintubber did not. From my experience of playing Galway teams and especially Corofin you have to bully them before they bully you. Get physical and they dont like it. Target their so called stronger players for some “attention” and you will find that they react unkindly to the odd shoulder or two. Also one poster did point to the kick outs as a major issue. Ballintubber kicked straight down the middle but corofin kicked well directed balls to runners on the wings away from the crowded middle. We would also need to come down from giving such high praise to Rochford as any manager who is worth his salt could manage a decent team of players like corofin. you should hold your judgement until the new year when they have an semi final match. The thing about Diarmuid O’Connor is, he is not really an out and out scoring forward. He actually played at midfield in the All-Ireland winning minor team. Although he is well able to score too. He is more in the mould of a prototype hard working, play-making, creative half-forward. He is not the type of player that will score in every game and you wouldn’t really expect that either. Even the best half-forwards of the recent era like Paul Galvin, Paul Flynn and Brian Dooher wouldn’t be expected to score in every game. If we’re looking for out and out scoring forwards then it will be players like Evan Regan and Darren Coen etc. that we will need to play that role for us. With Evan being well able to score from left footed placed balls, that would be a big addition for us, a lot will depend on his progress next year. In relation to Jason Gibbons, its a pity really that the year went the way it did for him. At the beginning of the year he was playing really well but things went sour for him then after his injuries. Hopefully after some rest time he’ll be back to his best next year. Roll on the FBD games! Well said Mr. T…..a lot bull on here that last couple years about mayo teams, there simply not gettiin over the finishing line, bar the minors last year simple as that. Its depressing all the mayo team or clubs getting to finals down the years and coming up short……wonder what’s the percentage in last 20 years for prov. and all ire. 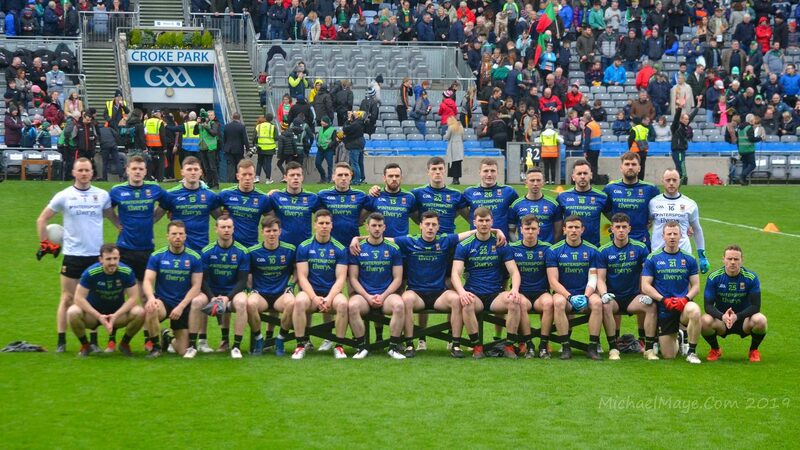 finals involving mayo teams, must be very low , excluding the ladies team that is…..anyone come up with that 1, abit of research needed ……. James O Donoghue didn’t score in the all Ireland final so I guess for some here he wouldn’t be good enough for a forward line either, eh??? I for one was not laying all the blame on Diarmuid O’Connor and Jason Gibbons for Ballintubber’s defeat. I was mainly looking ahead to next year and Mayo’s prospects and those players potential contribution. And in comparing Diarmuid and Alan Dillon it is worth noting that Alan did not play Senior for Mayo until 2004. [Championship v N York]. I think he was minor in 2000 so he would have been aged 22 in 2004, two years older than Diarmuid next year. Not all of Ballintubber kickouts went straight down the middle. In fact a few of them went out over the sideline as the ‘keeper was presumably trying to find wingmen. Agreed we need scoring forwards but putting great hope in Darren Coen and Evan Regan may be a bit optimistic. Darren has been on the panel for a couple of years now and has never shown any greater aptitude than our tried and tested forwards while Evan has yet to play a serious Senior county game. And freetaking left or right is not a major problem with our current players. I do however think that we have needed a good strong distributor of the ball on the 40 for a number of years now and if Diarmuid can fill the role then great. But that was not where Ballintubber used him against Corofin so we have to withhold judgement there. D O’Connor may be good enough in a couple of years and indeed turn into a class act. Hopefully he will. Lot of pressure on him considering who his brother is and all that is being talked about in Mayo about him. hopefully he can handle this pressure and develop his own style that fits into the way Noel and Pat want the team to move forward. But at the moment he is still a player for the future and should not be nourished rather than expected to be the game changer. Same goes for Evan Regan. Anyone expecting him to come into the Mayo squad and fit seamlessly into the current setup is expecting a lot. Most young guys take 3-4 years to progress to that level. Yeah I suppose the thing is you just never know how quickly a player will progress and develop. If you take a player like Paul Murphy, who came into the Kerry team this year for his debut season. He ended up the year with an All-Ireland medal, an All-Star Award and he won the MOTM Award in the All-Ireland final. As they say, anything can happen in sport and who knows what the 2015 season will hold. We have seen plenty of Diarmuid O’Connor so far. A few league games, New York and the major part of the Connaught SF. Enough to show that he is quite capable of making the grade. And focusing on the Club final can be misleading. I thought both O’Sheas very poor for Breaffy in the CF last year. This didn’t prove much of a guide to their continuing excelence this year. So a Connacht title is worth f**k all by your logic, Mr T? I’ll give credit where it’s due, and it’s due here. I dont know where the insults were slung by me but obviously you feel differently . You’re a gas man, Mr. T 😀 No bitching, I say it as I see it, as indeed you appear to do yourself. For clarity, to the best of my knowledge I’ve never even met Mr. Rochford, so my “soft spot” is held on the basis of a man from a neighbouring parish leading a team to a Connacht title. You’ll forgive my generosity of spirit, I’m sure, given that I attended the games to support Ballintubber. Answer, “My god there are some so called experts on here who most probably never kicked a ball in their lives. I have not posted very much here before but i think i wont be returning even for a look after reading the rubbish on here”. Fair play to you, judge and jury. “No reason to get nasty Just because you might hold a soft spot for Mr Rochford”? That’s out of order Mr T.
Anne-Marie is due an apology from you for that. Grow up. Do you pity the fools on this forum? Maybe he just needs his glass of milk? I really have pity for you and pebblesmeller. I dont really have much time to spend lamenting away my evenings or days on Blogs. Blogs or open forums like this are for the general public to stress their opinions about certain items of the day. I stressed my opinion of the match above Job done.